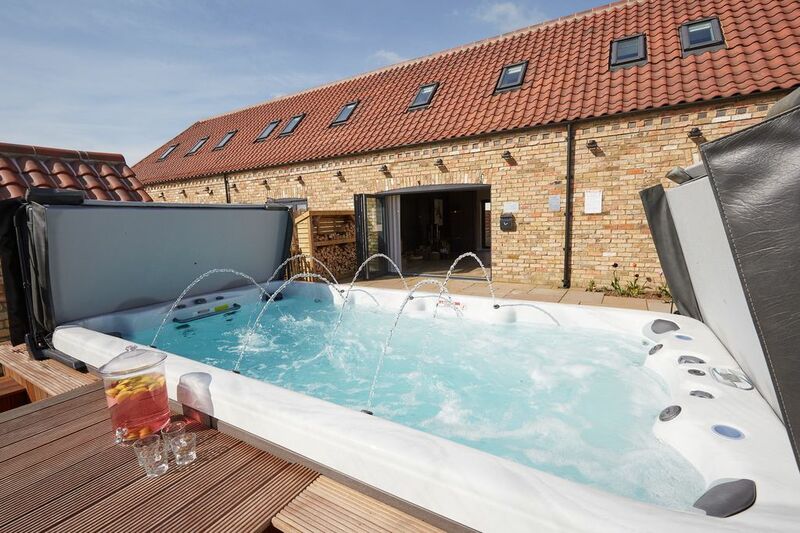 Lying just 5 miles from the centre of Lincoln, these four contemporary, luxury holiday barns are nestled on a quiet, no-through country lane with the owners living nearby. Each barn is arranged around its own inner courtyard with private swim spa that comfortably seats 10 people. The swim spa can be used as a hot tub to relax in after a day exploring the area. Luxury barn conversion with open plan living on the ground floor. Large well-stocked kitchen with all appliances plus drinks cooler and coffee maker. Spacious dining area with seating for ten at large table. Comfortable deep sofas around the log burner for cosy relaxation. Two double en suite bedrooms on ground floor and three double en suite bedrooms on first floor. Bifold doors lead to patio with hot outdoor shower and huge swim spa for ten people. Lovely large garden with gas barbecue, table and seating for ten. French doors lead onto sheltered pretty courtyard with table and seating. We have just returned from a weekend stay at Ashlin Farm Barns (Field Maple) for a friend’s hen party. From the very beginning when enquiring about the accommodation, the booking process and any questions along the way the team were more than helpful and made the process extremely smooth. First impressions of the barn were WOW. The interior is of such a high standard and even better than the photos, the attention to detail is amazing. We were greeted by Natalie who we’d been in contact with since our booking, who went above and beyond to help settle us in for the weekend. Every room was spacious, spotlessly clean and with all the essentials provided including some lovely extras such as robes, slippers and a homemade cake! The highlight of the barn was definitely the swim spa/ hot tub! We couldn’t recommend Ashlin Farm Barns enough and already have done to family and friends, we were very sad to leave it and hope to be back in the future! My second time staying at Ashlin Farms, absolutely loved it! Tom and Natalie are the best hosts who can’t do enough for the guests. Loved all the little extras, (gift bags for the children, homemade cake, cheeseboard etc) really give a personal welcome. We came here as a whole family of 10, three generations ranging from 69 to 3 months. We could not fault the accommodation .It was spotless . The hot tub , which is huge provided so much fun for all. Goodies provided were magnificent . The children had little bags of pressies which were fantastic .Toys were available along with books . Utensils and crockery etc were plentiful,wanting for nothing . Apart from all that we were treated to The Red Arrows training !! The area is good and the nature trail at the bottom of the lane worth a peaceful walk around . Thankyou it was a lovely holiday ..highly recommended . As a group of ten we've stayed at Ashlin Barns twice before and will be booking again. The barns are beautifully decorated with everything you need and more (the welcome pack was much appreciated!) The swimspa is fantastic for the ten of us, perfect size, perfect temperature and perfectly cleaned every morning. They've thought of everything. And it's only a ten minute drive to Lincoln! A great place to stay. It had everything we needed for our long weekend birthday celebration. Three generations of our family very happily spending time together in a house big enough for everyone to find their own space or come together as a group. The extra large swim spa was a particular success. We also enjoyed the local walks, trips in to Lincoln and a surprisingly easy trip to the beach at Mablethorpe. We would all highly recommend. Asylum Barn Farms. Perfect from start to finish! 10 adults and 1 dog had a long weekend for 30th birthday celebrations. The house completely exceeded our expectations, it was finished beautifully and had everything we needed.The underfloor heating and wood burner made it lovely and cosy for the cold December evenings. The hot tub was plenty big enough for all 10 of us and stayed lovely and warm at all times of the day! The welcome treats on arrival, bath robes and slippers, and tasteful Christmas decorations just made it that extra bit special. The only negative of the trip was having to leave on Monday morning! We are already discussing our next trip to Ashlin Farm Barns...an absolute gem!